ROCK HALL – Steve Mason’s father always wanted to be a farmer. 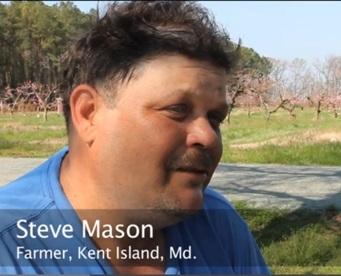 After raising his children in Prince George’s County, he bought a piece of land on the water on Kent Island on Maryland’s Eastern Shore, and planted peach trees. Now Mason is carrying on his father’s dream, but his land is at risk of being affected by sea level rise and storm surge from hurricanes in the coming years. Maryland has more than 5,200 miles of state roads and about 21,000 miles of county roads, according to the Maryland State Highway Administration. A CNS analysis found that roughly 800 miles of roads would be affected if sea levels rise another 2 feet. At 5 feet, an estimated 3,700 miles would be under water.